Only if you take '97/'98 as a template - it was similar - no pattern observable if you take the 72/73 and 82/83 strong events into consideration. The data base is too limited for any meaningful assessment and global conditions have seen big changes in recent years. The 3.4 anomaly is now at +2.8C, matching the 1997/98 peak value. Upper ocean heat in the equatorial Pacific is continuing to climb and is now at the highest observed levels during this Nino so far, so we could see further warming at the surface too. All the while, the CFS is beginning to delay the transition to neutral and -ve values next year. Anytime you see Nino 4 spiking like it is watchout as Nino 3.4 isn't done with just 2.8C. We should eclipse 3C in the next couple of weeks to make this El-Nino the strongest ever. I also suspect we might peak @ 3.2C in December as there is a new OKW building subsurface as there were 9C anomalies in a small area before the TAO site went down this past weekend. The SSTOI index has different values to the cpc (though not a million miles away) but if we take the cpc values and the 0.7 bias to 3.4 over 1.2 (2.8 vs 2.1) then we have the strongest bias to the west since since March 2010 possibly. Hopefully we can see 1.2 weaken enough that the atmosphere responds more as if west based than basin wide. As it is so interesting playing around with the historic reanalysis, I couldn't resist having a look at Nino 1877/78. Boy was that strong but how accurate are these proxy based simulations? Interesting to note 82/83 saw a very mild Jan and a cold snowy Feb - did we see a SSW that year? 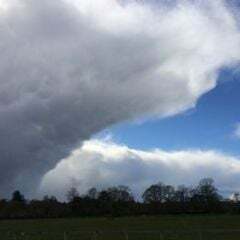 97/98 produced a generally very mild winter, but colder synoptics in early-mid spring, perhaps this is why many forecasts are suggesting a possibility of cold conditions later in the winter. Kaplan's Extended SST Version 2 (LDEO) Oceanic Nino Index ASO Rankings (1870-Present). The latest ONI value ( 2.11C) officially set a new record high in this dataset, beating out both 1877-78 & 1997-98. This is also the 13th highest value that's ever been recorded for any tri-monthly period in Kaplan's Extended SSTv2, with only the 1877-78, 1982-83, & 1997-98 "Super" El Ninos registering higher in the ONI, & given that the NINO 3.4 SSTs still haven't peaked yet, we're liable to move up further in the rankings &/or break a record in the next update or two. Additionally, for the 2nd month in a row, the tri-monthly averaged BEST Index set a new record high. Note: I have adjusted this data with a 30-year sliding base period to attempt to remove the inherent warming signal in this index). That's the sort of analysis I'd love to be doing myself if I could spare the time at the moment - fascinating stats illustrating just how impressive this year's event has become. Nino 3.4 daily anomaly is now at +3.0C. You won't see this many times in your life. Indeed. That anomaly of +3.0C for the Nino 3.4 region is now the warmest on record. Incredibly warm waters continue to build across the equatorial Pacific, and the El NiÃ±o event of 2015 has just set a record for the warmest waters ever observed in the equatorial Pacific over a 1-week period. Sea-surface temperatures (SSTs) in the Pacificâ€™s NiÃ±o3.4 region, between 90Â°W and 160Â°E longitude and 5Â° north/south latitude, are considered the benchmark for rating the strength of an El NiÃ±o event. The weekly departure of SST from average in this region hit +3.0Â°C (5.4Â°F) over the past week, NOAA announced in their November 16 El NiÃ±o update. This exceeds the previous 1-week record warmth in the equatorial Pacific of 2.8Â°C above average set during the week of November 26, 1997; accurate El NiÃ±o records extend back to 1950. However, the standard measure for the strength of an El NiÃ±o event is the three-month average NiÃ±o 3.4 SSTs, and the El NiÃ±o of 2015 is not yet officially considered the strongest on record. Beginning to wonder with region 3.4 being +3.0C and region 1+2 being 1.5C whether this may cause the response from the El Nino to be more modoki like? As in previous years the temperature difference between those regions must have been the same? The last week the Aleutian Low seems to have drifted further west with High Pressure ridging into Alaska. 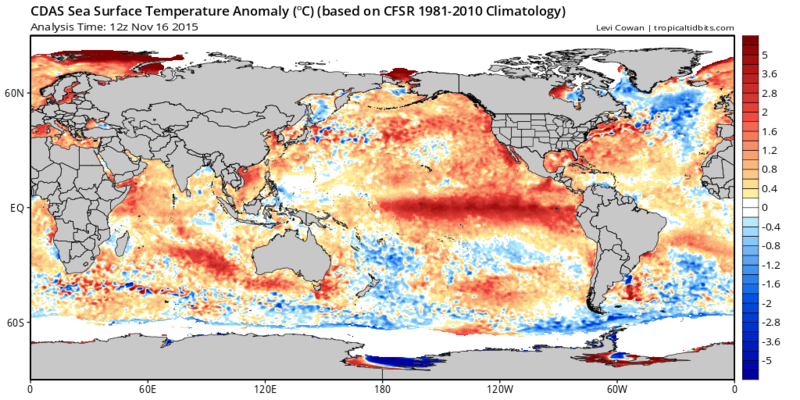 Is there any cooling in the east pacific yet? Edit: to answer my own question, according to the climate prediction center, there is a gradual cooling in the eastern Pacific but the ssts are still high there (+2). If you take SST anomaly change over the last seven days, movement is certainly in the right direction. Region 4 has seen a warming and 1-2 a slight cooling. As to whether it is the differential between regions or the actual temps - not sure anybody knows the answer to that - we're kind of in new territory here as far as the overall Pacific profile. NB - The above images should update, might make the text out of context on future viewings. I suspect its not solely the relative difference and so would say that it will still act basin wide however if 1.2 goes below 1.0 then I'd be cheering. With the absolute SSTs being higher in the Central Pacific regardless of El Nino 'flavour', the resultant weakening of the Walker Cell and tropical convection probably remains more or less the same for both CP and EP events. What appears to set CP events apart is that the EP is cool enough to interrupt the enhancement of the Pacific Jet, in light of which Summer Blizzard's thinking makes a lot of sense to me. So we have a way to go yet - but there are plenty of hints from the longer range model guidance that the EP could cool sufficiently by mid-winter to generate more of a CP type atmospheric response. I believe the atmosphere has been racing along 'ahead of schedule' in terms of response to the current El Nino, in that we've seen a strong displacement east of the Azores High before the winter season has even got underway, followed by wave breaking along the typical El Nino path but sooner than the analogue years seemed to suggest (to my eyes, at least). The trouble is, that pathway to stratospheric vortex disruption later in the season looks at great risk of being derailed by misbehaving tropical convection in the near future, as it becomes unusually active across a wide stretch of the Indian Ocean in particular. Because of this, I am starting to get the feeling that a transitory CP El Nino type atmospheric response may be our greatest card when playing for an extended cold, snowy period of weather this winter. Please, oh mighty El Nino, metamorphose into a CP event and save us from chasing toppling mid-Atlantic ridges that tease but seldom deliver for the snow-starved southerners! 2015 and 1997 El NiÃ±os: DÃ©jÃ vu, or Something New? El Nino 2015 beats its own record for the largest weekly anomaly in the 3.4 regions, now up to +3.1C. All other ENSO regions have either warmed or remained stable over the past week. However, a cold (upwelling) wave has been set in motion, and looks strong than the weak one that have occurred over the last year. Something to keep an eye on. Disappointing to see that the cooling in East Pacific has stopped. If this cooling does occur, will it be 1.2 or 3.4 which feels it most? It would still be a few weeks away before it could influence surface temps, possibly into 2016. It might not have any effect though, like the previous ones this year. We'll just have to wait and watch. I've put this in the North American thread but it also may be of interest here. Thereâ€™s been a great deal of discussion with regards to this yearâ€™s El Nino event underway in the eastern Pacific. Looking at a map of ocean temperature anomalies at the surface, thereâ€™s no doubt that the 2015-2016 El Nino will go down in record books as one of the strongest El Ninoâ€™s observed. Just look at that long tongue of warmer than average sea-surface temperatures, from the coast of South America all the way to the Date Line along the equator. Latest CFS.v2 mean predicts El Nino through into Summer 2016. Question for whoever feels they can answer this: Is there a lag effect between an el nino becoming Modoki (central based) before it affects our weather or can the response be pretty quick? Of course other factors can play a big role so this is a totally hypothetical question.